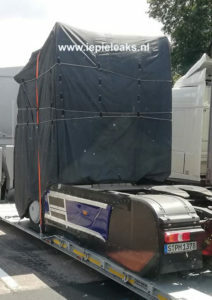 New Actros on its way! Mercedes-Benz is going to launch a new generation of the popular Actros during the IAA in Hannover. This truck that was caught on the road in Dresden, Germany. There is a lot covered on this truck, but it definately is an Actros when we look at the chassis. The cab is completely covered but we do see a stalk high at the front of the cab. 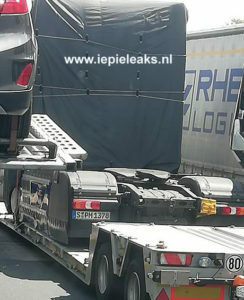 That could be the camera, because we have information that this Actros is going to be the first truck that you can order without mirrors but with a camera system. Then there are the front wheelhubs with the Kasbohrer logo, that is strange. Is that to mislead us? And what about the covered rear wheels, why make so much work of covering a wheel? Is there an electric wheelhub engine hidden behind the cover? We will see later in Hannover, but in the meanwhile, when you see something: Please let us know! And thanks for these pics Franky! ← First photo’s of new heavy Ford Truck!